It comes as a South African appeals court prepares to rule on whether he should be sent back to prison. 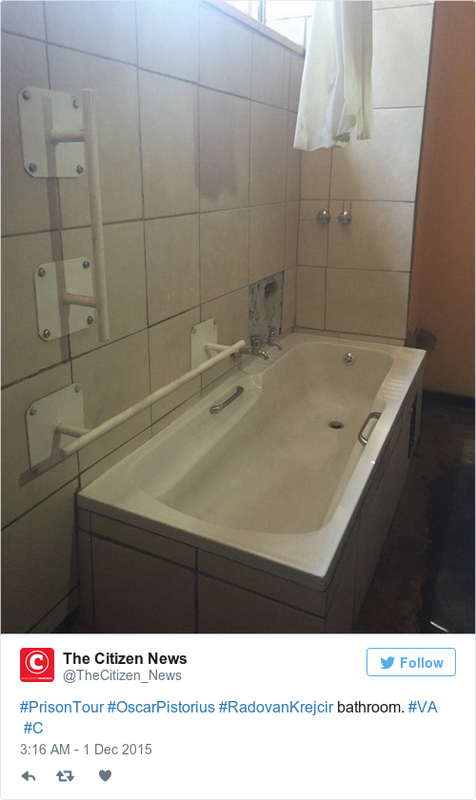 THE SOUTH AFRICAN prison cell where Oscar Pistorius stayed for a year for killing girlfriend Reeva Steenkamp is furnished with a single mattress on a metal frame, a basin, a small cabinet and a barred window whose view is blocked by a metal screen on the outside. 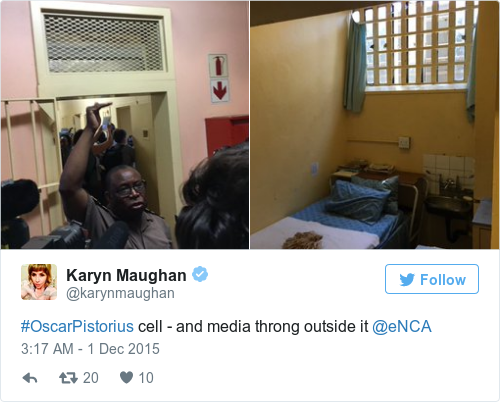 Journalists got a look at the former cell of the double-amputee Olympian during a tour of the maximum security Kgosi Mampuru II Prison in Pretoria today. Pistorius, 29, was convicted of manslaughter for shooting Steenkamp on Valentine’s Day 2013. He was released from jail on 19 October after serving one year of a five-year sentence and is under house arrest. An appeals court is preparing to rule on whether Pistorius should be convicted of the more serious charge of murder and sent back to prison. Prosecutors say Pistorius shot Steenkamp during an argument. The defence says he killed her by mistake, thinking an intruder was in his house.